It is of course a whodunnit, but I registered it as literature. Great book, beautiful story, well written, and a page turner. Released on Wednesday, February 11, 2004 at controlled release in Utrecht, Utrecht Netherlands. 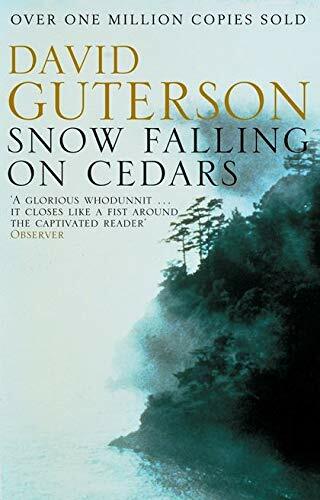 The other Guterson I found quite sad and very well written. Looking forward to this one! A page turner indeed. I am not so much into whodunnits, or whydunnits, but this must be one of the best of it's kind. After the second world war, a man of Japanese parents, born and raised in rural America, is on trial for murder. As this courtroom drama develops, all kinds of emotions are voiced, the call for justice, the lingering hatred remnant from the Japanese attack on Pearl Harbour, a broken heart from a love long lost. A very well written and gripping story, but the characters and what moved them, remained somewhat of a mystery to me. Released on Sunday, August 29, 2004 at Controlled Release in Controlled Release, Controlled Release Controlled Releases. This one goes into the bookbox2, on the way to a new home. Powerhouse, mocht dit nou niet de bedoeling zijn, dan jaag ik kataklop kataklop achter de boekenbox aan tot ik hem weer te pakken heb voor je! Indeed, great read, this book. I took it for the wife of a colleage and hope that she too will become bookcrosser and get so many magnificent books.